You'll discover tucked-away gems like Bellevue Beach and Nuuksio National Park. Seurasaari Island and Open-Air Museum and Katajanokka are good opportunities to explore the local culture. And it doesn't end there: admire the masterpieces at Kansallisgalleria, browse the eclectic array of goods at Hakaniemi Market, and wander the streets of Ullanlinna. For traveler tips, where to stay, and tourist information, read Helsinki online travel route builder . If you are flying in from Spain, the closest major airport is Helsinki Vantaa Airport. Expect a daytime high around 24°C in August, and nighttime lows around 13°C. Cap off your sightseeing on the 15th (Thu) early enough to go by car to Turku. On the 16th (Fri), indulge your thirst for a good beer at Mathildedalin Kylapanimo and then identify plant and animal life at Tulliniemi Nature Path. 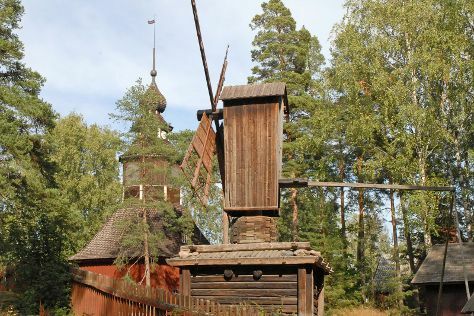 On the next day, see the interesting displays at Kylamaki Village of Living History, kick back and relax at Ispoinen Beach and Sauna, and then trek along The Archipelago Trail. To see reviews, ratings, other places to visit, and other tourist information, read our Turku driving holiday tool . You can drive from Helsinki to Turku in 2 hours. Other options are to take a train; or fly. In August, plan for daily highs up to 23°C, and evening lows to 12°C. Wrap up your sightseeing by early afternoon on the 18th (Sun) to allow enough time to travel to Inari. On the 19th (Mon), take in the architecture and atmosphere at Pielpajarvi Wilderness Church, trek along Juutua Nature Trail, then admire all the interesting features of Inari Reindeerfarm, and finally identify plant and animal life at Wildlife Areas. Get ready for a full day of sightseeing on the next day: head outdoors with Lemmenjoki National Park. Start your trip to Inari by creating a personalized itinerary on Inspirock. Traveling by flight from Turku to Inari takes 5.5 hours. Alternatively, you can do a combination of train and flight; or drive. Plan for slightly colder temperatures traveling from Turku in August, with highs in Inari at 19°C and lows at 9°C. Wrap up your sightseeing by early afternoon on the 21st (Wed) to allow enough time to travel back home.